Did I Spend Enough Time with my Son? According to the Pew Research Center, 61% of mothers work outside the home. The same review tells us that 42% of people feel that mothers should not work outside the home. I’m afraid that we mothers often feel guilty. We feel guilty about leaving our children, not spending enough time with them, not giving our spouse or partner the attention they desire, about so many things. I know that I did the best that I could do raising Aaron and there are only a few things that I would change if I had it to do all over again. Prioritizing my time is definitely one of the things that I would change. My home has always been a source of pride for me. Today, it looks lived in and is mostly clean. I was more particular when I was a young mother. I thought that the house had to be clean at all times for me to be a good wife and parent. I thought that I had to do it all! I now know better. I think of all the time that I spent cleaning and picking up when I could have been sitting on the floor playing with Aaron. Did the toys have to be put away multiple times a day? Was dusting the furniture really all that important? Time with my baby and toddler is lost; it is something that I cannot get back. There are things that have to do, but be reminded that there are other things that can wait or that someone else can do for you. Did I make enough time for Aaron; probably not, but he turned into a wonderful, caring young man who loves his “Mom” very much. 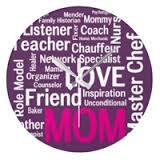 Enjoy Mother’s Day, I know I will; I have learned to make the time for those I love.